Debris from crashed Russian jet lies strewn across the sandat the site of the crash in Sinai, Egypt, Oct. 31. Russian Emergency Situations Ministry rescuers engaged in a search operation on the site of the A321 aircraft crash in Sinai have found over 20 pieces of personal belongings of the crash victims and 12 pieces of plane debris and parts, director of the ministry's fire rescue forces department Alexander Agafonov said. More than 100 rescuers were deployed to the crash site in the evening of November 1. "They have done the initial reconnoitering of the crash area and have found plane wreckage. Search parties of the Centrospas unit and the Leader Center of the Russian Emergency Situations Ministry mounted on four cross-country vehicles went there at 6:30 a.m. They are doing the work together with the Egyptian authorities," Agafonov said. Russian Emergency Situations Ministry rescuers, representatives of the Egyptian authorities and Egyptian servicemen deployed in the search operation zone are closely interacting. 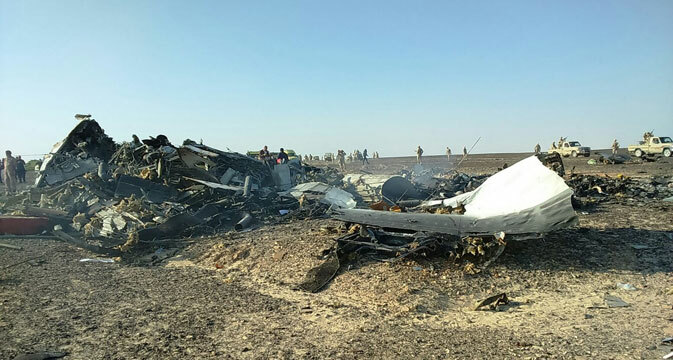 Egyptian Armed Forces Brigadier General Mahfouz al-Bayoumi, who heads the Egyptian group in the crash area, said that "the work at the crash site is being executed in close contact with Russian rescuers." More than 500 servicemen of the Egyptian army are participating in the search, he said. Security has been tightened. The Egyptian side is doing its best to support the work of Russian search parties. "One hundred and twenty roadblocks have been placed, and servicemen are protecting the Russian Emergency Situations Ministry base and the access routes. The Russian Emergency Situations Ministry camp is receiving logistical support," the general said.